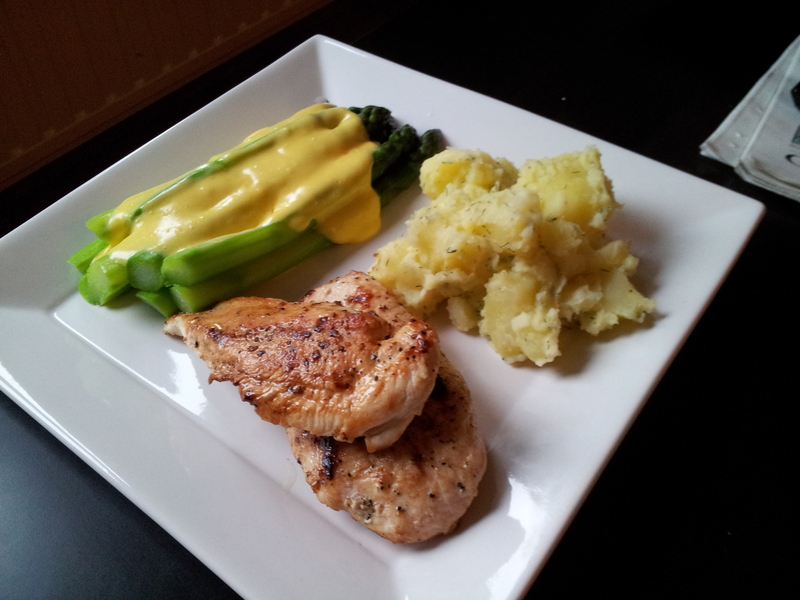 Spring time treat- pan fried chicken,new potatoes,green asparagus and hollandaise sauce. An easy but classy spring-style meal in 30 min. Sometimes we want to treat ourselves a little bit, and there’s nothing wrong about that. In under less than 30 minutes you can turn simple chicken fillet, some asparagus and potatoes into a classy, posh looking dinner and wow your guests. Extra tbsp of butter for the potatoes. – serves 2-3 people. First- work methodically, make your hollandaise the last-cause it doesn’t sit well, so don’t let it sit and wait for you..it’s better if you make it and serve it right away. Peel your potatoes and cook in salted water until tender,then crush a little bit with a fork,add butter and dill, cover the pot with a lid and let them sit. Fry the meat-let the chicken brown properly. Season the meat with salt and pepper,and turn only once. Once it’s browned nicely,pop a little bit of cold butter into the pan and keep pouring it over the meat,it’ll give it a nice colour..and colour means flavour. When the meat is frying-cook you asparagus, they’ll be ready in about 2-3 min,so after that take them out quickly and pop them into some cold water to stop the cooking process right away. Now-when the meat is almost there,potatoes cooked and resting,asparagus are done..it’s time to make your sauce. It’ll take about 10 min,so the meat will have the time to rest. Take 2 egg yolks, add a pinch of salt and a tbsp of lemon juice and start whisking until the yolks expand,go paler and thicken up. Melt your butter and let it cool slightly. Put your yolks in a copper or metal bowl on top of a pot with some water gently simmering, so the steam can cook your sauce. Don’t let the water touch the bowl though. Whisk the yolks until they go paler and paler. Once you can see the whisk leaving marks in the yolks-start adding the butter,first drop by drop,then a little more,to emulsify the sauce. Take the bowl off the pot every now and then-the residual heat will keel cooking the sauce,but your eggs won’t scramble. In about 3-4 min it’s done. Check seasoning and add more salt and lemon if needed. Plate up and enjoy! this recipe would work just as well with salmon or other fish instead of chicken..for vegetarians-you can use a poached egg.